This pair of chairs consist of a top rail leading down to shaped arms with carved foliate design and superbly carved dolphin head and foliate decoration forming the arm supports with carved floral block below. 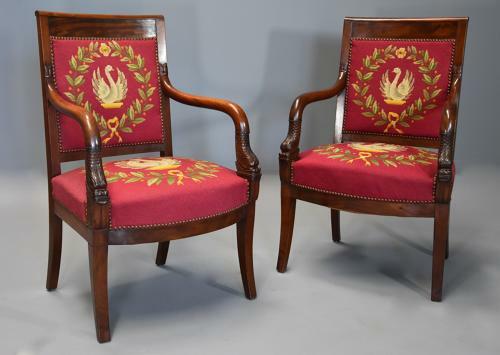 The chairs are upholstered in red wool work consisting of Napoleonic symbols of a white swan within a wreath on the backrest and seat with a bee to the back of the chair, this upholstery is in very good condition – (this can of course be changed if required once purchased) and leads down to the bow shaped front seat rails with sabre legs to both the front and back. The upholstery is probably not original as it is in such good condition but the chairs have been carefully conserved in upholstery similar to that of the original style. The swan, a symbol of love and fidelity and adopted as a symbol by Napoleon’s wife Josephine, the wreath, a symbol of honour and victory and the bee was chosen by Napoleon as a symbol of his Empire, bees were a symbol of the ancient sovereigns of France. This pair of open armchairs are in very good condition for age, are of stable construction and can go straight into a home.